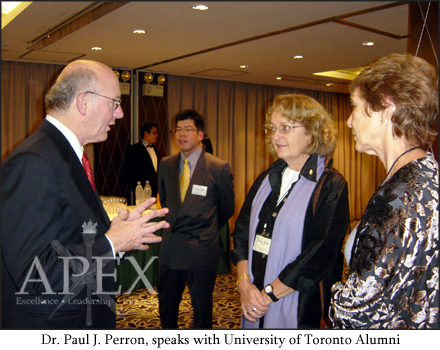 On November 18th, 2004 at 6P.M., the University of Toronto held a two hour evening reception at The Landis Taipei Hotel, in conjunction with APEX Honour Society, for its alumni in Taiwan. Special guests were present, such as the highly accomplished Dr. Liu Chao-Shiuan, the President of Soochow University, the dignified Ms. Krista Slade, Associate Director of the Division of University Advancement from the University of Toronto, and the respected Mr. Dave Murphy, Director of Trade and Investment at the Canadian Trade Office in Taipei. Students and faculty were also in attendance to meet with business leaders and academic scholars, in addition to learning more about the University of Toronto and discovering new opportunities in Canada.